A challenge I’ve come across with small nonprofits is finding a fundraising idea that will make a big impact, but will also be inexpensive. From my experience, there are six types of fundraisers that successfully meet both these criteria. Read on to learn how these ideas can help you raise more. For small nonprofits, a raffle is an inexpensive fundraising idea that can generate a lot of funds for your nonprofit. This fun and inexpensive fundraiser can be tailored to fit any organization or project. 50/50 Raffle: This is the most cost-effective raffle because you don’t have to purchase a prize; the winner is awarded half the money raised from ticket sales. Balloon Raffle: This involves placing raffle tickets in balloons and having supporters purchase and pop balloons to get their raffle tickets. Potluck Raffle: This involves getting together with your supporters and enjoying great food. Participants can bring a dish and have people vote on their favorite using purchased raffle tickets. With so many types of raffles, this is a fun and simple fundraiser that works great for all ages, making it an especially perfect fundraising idea for schools. Here’s the story of how one small school raised $6,000 by getting their students to sell raffle tickets. Additionally, you can keep costs low (and maximize the funds you raise) by asking local businesses or supporters if they’d donate items to give away as prizes for your raffle fundraiser. Just make sure the prizes are things that your donors would want. And if you need more ideas, here are 20 other types of raffles. Pro Tip: Combine your raffle with another fundraising event (like a charity auction) to raise even more funds for your nonprofit. Hosting a t-shirt fundraiser is a fantastic idea because not only do you raise money, but when people wear them, they help to promote your nonprofit and mission. This radio station was able to raise $32,565 in just 30 days with a t-shirt fundraiser. You can get started right away by selecting a fundraising website (for guidance on picking a t-shirt or any kind of product fundraising site, check this page out), uploading your nonprofit’s logo and slogan and then spreading the word to your members. Many t-shirt fundraising websites don’t cost a thing and they print and ship the t-shirts to your supporters. You’ll receive all the profits. But, if you’d like to have a handy stash of t-shirts to take with you to events, there are other cheap t-shirt printing options like Tiny Little Monsters, which offers special discount pricing for 501(c) nonprofits. Another idea to boost your fundraising efforts with t-shirts, is to include an extra option on your new membership application form like the example below. T-shirt campaigns work well because you can design something that matches your brand and represents your mission. They allow donors to showcase their support and feel proud about contributing to your cause. Plus, whenever supporters wear your t-shirt, they’re putting your nonprofit in front of everyone they come across. T-shirt fundraising can be very effective, and it works across a variety of fundraising organizations. From small nonprofits to churches, you’ll find that t-shirt fundraising is a recommendation option. Pro Tip: Combine your t-shirt fundraiser with an active event like a walkathon so that supporters have an opportunity to wear and show off their shirts. Crowdfunding is an inexpensive fundraising idea that helps your nonprofit spread the word about your fundraiser through social media. Create a campaign webpage with photos and videos to help narrate your story. Share your campaign through your social media channels like Twitter and Facebook. If you need some help setting up yours, take a look at these six great examples. You can raise money for any project or cause. In fact, some crowdfunding sites target a specific category: charities, creative projects, or schools. That way, you can reach out to a specific audience and share your mission. Some platforms offer incentives based on different donation levels to further encourage donors to give to your nonprofit. If you’re interested in creating a crowdfunding campaign, the first step is to find a platform that will help you accurately portray your organization’s mission and raise enough funds to further your cause. Customization features so that you can design your page to match your nonprofit’s brand. Social sharing buttons in a prominent location so that donors can share your campaign with their peers. A visual way to display your campaign's progress (like a fundraising thermometer). The next step is to develop a crowdfunding strategy. If you need some help, check out these 5 church crowdfunding strategies (which can be applied to any type of organization) to help maximize gifts. Crowdfunding is a great option for small nonprofits because your campaign has the potential to go viral. Plus, it’s another platform to share your story with potential donors. Just remember to thank donors for making a contribution and sharing your fundraiser. The more you engage with donors and show your appreciation, the more you’ll be able to cultivate deeper relationships. Pro Tip: Make sure to include video and images on your crowdfunding page. The more engaging your story is, the better chance you have of encouraging donors to give and reaching your goal. Did you know that corporations offer matching gift programs where they will match their employees’ donations? After donors give, they can submit a request to their employers, and the companies will send you a donation of the same amount (or more). Your nonprofit has the potential to double the amount of funds you raise. Matched gifts can be applied to most donations, including gifts made to specific fundraising campaigns. Nonprofits don’t have to do anything extra to receive the second donation. With that said, all the responsibility to request a matching gift lies on the donor. But most donors don’t know that their company offers a matching gift program, and if they do, they’re not familiar with the submission process. That’s why it’s important to make your donors aware. 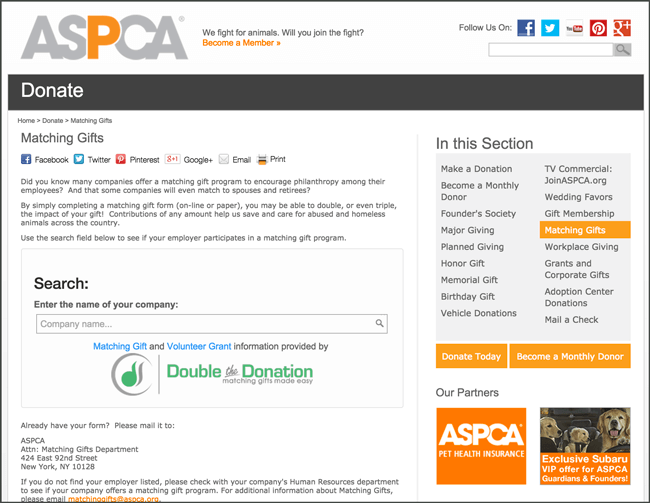 The ASPCA created a dedicated matching gift section on their website that explains the process and includes a search tool. Donors can search for the company’s matching gift program to get more specific information. In your acknowledgement letter and donation receipt. Via social media or email newsletter. Pro Tip: Promoting matching gifts should be something that you’re doing continuously to make sure that your donors are educated on the submission process. Walkathons are the most popular choice of fundraiser by small nonprofits, because they’re the easiest to plan while having a high return. Not only can you raise money through event registration, but you can also raise funds through pledges and merchandise. Walkathons can work for a lot of different situations. For instance, if your supporters are spread out or if you have a large group of interested participants who can’t make the date you schedule, you can hold a virtual walkathon. For virtual walkathons, participants will all walk on their own in their own communities at the same time, rather than congregating in a shared space. Donors can map out their own routes and pledge a donation for every mile they walk. To plan your walkathon, you’ll need to make sure that you pick a season that has good temperatures and map out a route for your walkathon. Make sure that you get all the necessary permits to host your walkathon in the location you choose. On the day of the event, you’ll want to set up a table with water and fans, especially if it’s a really hot day. You’ll also want an area with first aid kits and other medical supplies (just in case). For some great examples of walkathons in action, check out these two campaigns. Pro Tip: Promote your event early to generate interest and create an online registration page so donors can easily sign up to participate. Peer-to-peer fundraising is a great way for small (and large) nonprofits to raise funds, because it makes it easy to gain new supporters. The proof is in the long list of successful campaigns, like this one run by The Education Cooperative (TEC). Essentially, peer-to-peer fundraising is when your existing supporters solicit donations on your behalf. With your help, of course, they’ll create a fundraising page, explain why they support your cause, and ask their network of friends and family members to contribute. Here are 10 great tips to get better performance out of your supporters. At the end of a peer-to-peer fundraising campaign, there is usually an event to thank your contributors and celebrate your nonprofit’s success. While your donors will be responsible for reaching their individual goals and soliciting donations, you still have a role to play. Recruiting your fundraisers: It’s important to ask your most loyal donors first as they are the most likely to participate. Share updates on your campaign’s progress: Keep the momentum going throughout your campaign by sending out encouraging messages to your fundraisers and posting updates on how the campaign is going. Connect with your new donors: Since many donors will make a contribution to support their loved one, they may not know much about your organization. Send them a welcome packet with information on your mission, and thank them for their contribution. Peer-to-peer campaigns can be a great fundraising idea because all you need is a platform to accept donations and interested supporters to help you raise funds. If you’re looking for an online donation tool to host your campaign, check out Qgiv’s list. Pro Tip: If you want to reach your goal, it’s important to set your peer-to-peer fundraisers up for success. Provide supporters with information or host a webinar on how to solicit donations. Whether you’re a school, church, or nonprofit organization, these fundraising ideas are made to help you raise the most funds for your cause. Whichever one your organizations picks, remember to have fun fundraising!